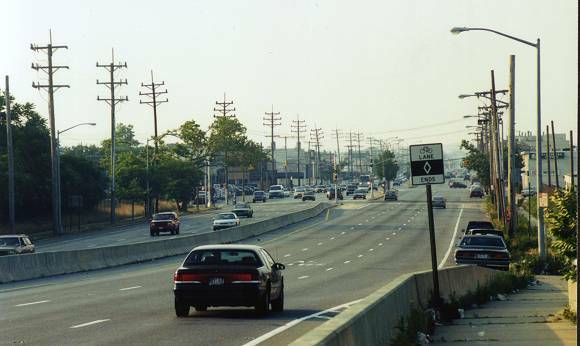 At the northern base of the bridge from Broad Channel, we peer into the heart and soul of Howard Beach. Cross Bay Blvd outdoes even its macabre Woodhaven alter ego in looking like the land that time forgot. It's trademark multi-masted utility poles evoke images of pre WWI street photos, when the utility poles all looked like vertical railroad tracks missing one rail. Don't the support brackets beneath each cross arm make them look like they're grinning and full of malevolent evil? These kind of ute poles always spooked me out as a kid. Just barely up on Broad Channel Bridge looking north over the shoreline of Howard Beach below. 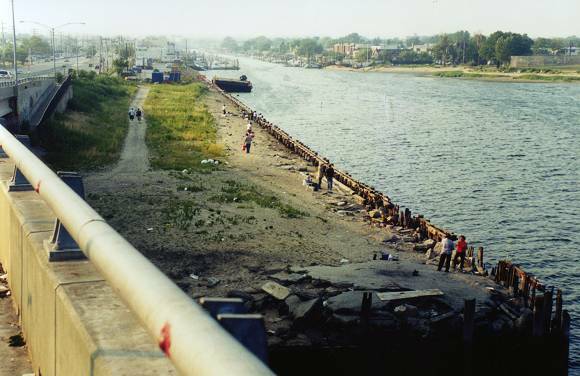 A canal separates much of Howard Beach from Cross Bay Blvd for several blocks. Unseen to the right is the active section of the Rockaway line, used by the subways. North of Liberty Avenue in Ozone Park, the abandoned section of the Rockaway line turns into the infamous Dead Tracks. 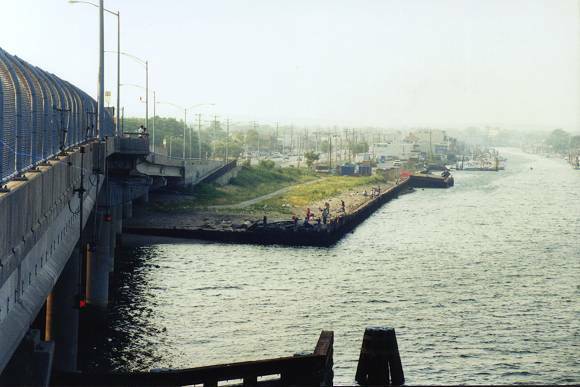 This bridge and its sister further south leading from Broad Channel to the Rockaways are popular perches for fishermen, as is the sliver of pier below. That blotch of red on the railing was probably fish guts. Now we're further out on the bridge. I think I was hanging out through a hole in the cyclone fence used for fishing, in order to shoot this. Just below me something else was hanging around. Among all of New York City's many outdoor illuminati, this must certainly rank as the most overlooked and least considered. 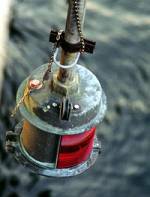 It is a warning light so boaters know a low bridge is ahead waiting to clip off their masts, or their heads, if they are not careful. It looks like something that would look real cool hanging in a garage, or a marine themed house of ill repute. 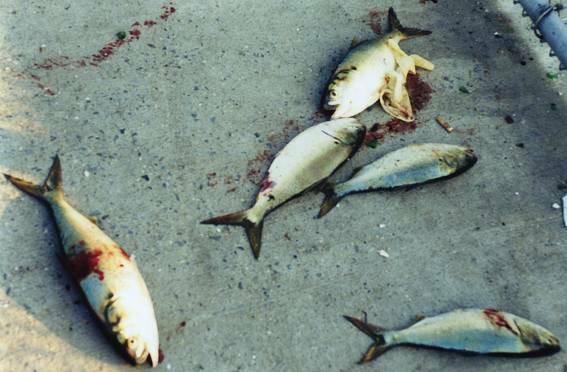 Remember the fish guts? Umm umm, honey! What's for dinner? Before you bemoan the senseless taking of life by sport fishermen who had no intention of at least eating the damned things, rest assured that the neighborhood seagulls had a grand old party here later that night. They have to eat too, and these unfortunate critters probably saved the lives of the clams that the seagulls did not have to hunt that evening. Ever watch a seagull hunt clams? Not a pretty sight.